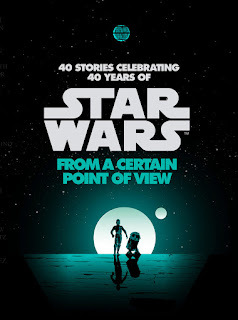 Faraway Press: The Online Home of John Jackson Miller: I return to Tatooine in October in FROM A CERTAIN POINT OF VIEW -- and to Star Wars Celebration next week! I return to Tatooine in October in FROM A CERTAIN POINT OF VIEW -- and to Star Wars Celebration next week! When Star Wars: A New Hope was first released in 1977, part of its appeal was that the world it presented felt alive. Landspeeders and starships were dirty. Droids broke down. And it was filled with cool, weird, and really weird background characters. (Really, just take a look around the Mos Eisley cantina.) Never mind Han, Luke, Leia, Darth Vader, and Obi-Wan. Who were these other guys? What was their story? Just seeing them brought up questions for fans that sparked the imagination. In celebration of Star Wars’ 40th anniversary, Del Rey is going to shine the spotlight on those unsung weirdos, heroes, and villains with a unique, new anthology. Star Wars: From a Certain Point of View, coming October 2017, will bring together more than 40 authors for 40 stories. Each will be told from the perspective of background characters of A New Hope — from X-wing pilots who helped Luke destroy the Death Star to the stormtroopers who never quite could find the droids they were looking for. Heh! Glen Weldon just interviewed me yesterday for NPR about something unrelated. Small galaxy! As noted, all author proceeds will be donated to First Book — a leading nonprofit that provides new books, learning materials, and other essentials to educators and organizations serving children in need. "To further celebrate the launch of this book and both companies’ longstanding relationships with First Book, Penguin Random House has donated $100,000 to First Book, and Disney/Lucasfilm has donated 100,000 children’s books — valued at 1 million dollars — to support First Book and their mission of providing educational resources to children in need. Over the past 16 years, Disney has donated more than 57 million books to First Book." Oh, yes, and as to my story? Well, as the headline indicates, I'll be making a return trip to the Jundland Wastes of Tatooine. Now that's a name I've not heard in a long time... a long time. So that one's available this October. Random House's preorder link is here; Amazon's link is here. More soon. Next, I have several appearances this month to mention. 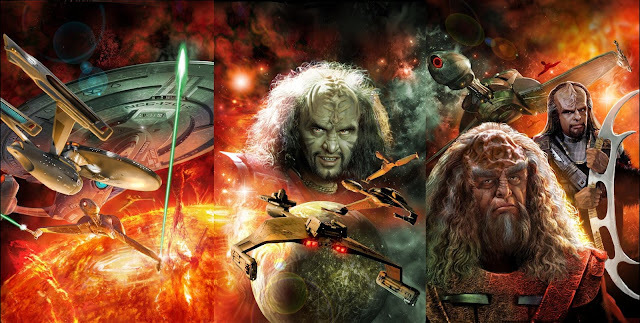 • First, on this coming Saturday, April 8, I will be appearing at Shelby County Star Trek Day in Memphis. That's at the Fox and Hound on Sanderlin; it starts at 11 a.m. and I speak at noon. I also will be there for a variety of podcasts and other events. • Finally in April, you will find me at Kansas City's own Planet ComiCon, my first time there. That's from April 28-30. I'll post more info on my Twitter and Facebook pages as it becomes available. And now, some more Star Trek to speak of. The third and final volume of Star Trek: Prey is now out in audiobook form, once again ably narrated by Robert Petkoff. You can find Book 3 on Audible and iTunes — and you can read my interview about the audiobooks on the official Star Trek site. A sample is below! And here's something fun: the awesome German covers of the trilogy, coming soon from Cross Cult. The backgrounds form a tryptych! Very cool. And until the end of the month, my Overdraft: The Orion Offensive book is just $1.50 on Kindle as part of their 150 for $1.50 promotion.